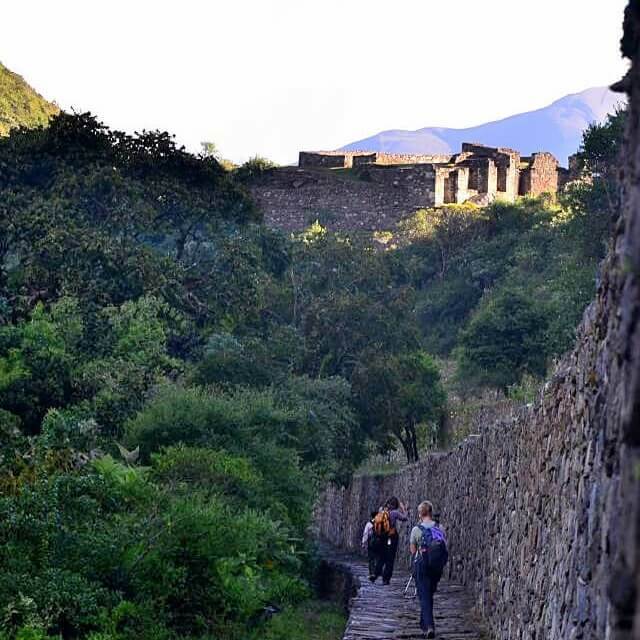 Your tour starts with a road trip to Ollantaytambo, the Inca village that reminds you of how the Inca people lived in their times. There are unique examples of narrow streets and water canals, in combination with new and modern features such as restaurants and shops within their walls. Ollantaytambo is also your starting point to Machu Picchu, taking a train to Aguas Calientes, the city at the base of the Inca citadel. Once back to Cusco, you have a day to finish adjusting to the altitude before your Vilcanota Mountain trek. Our breathtaking trek in the Cordillera Vilcanota, takes you to see the unique, multi-coloured "Rainbow Mountains." This is a must for passionate trekkers who want the cozy comfort of their hotel at night. You hike close to the highest and one of the most sacred mountains in the Cusco region, the Apu Ausangate,. The local name of this trek is Camino del Apu Ausangate. The Apu is the bearer of life and the guardian of one of the pristine mountain ecosystems you visit. On day 4 you reach the Vinicunca Pass, also nick-named the "Rainbow Mountain," with its amazing shades of reds and yellows. This fully supported hike uses llamas and horses that are owned by the shepherds of the Chillca community. These Andean people are proud to share their land and the spirit of their inspiring world with you at every step. Upon arrival at the Cusco airport, you meet your guide and transport who drive you to the Sacred Valley of the Incas via Chinchero. Tuesday is a market day. You see locals trading produce and shopping for clothes. As you stroll through the stalls, you encounter a good range of handicrafts, especially weavings. This area is famous for weaving and you may be able to see talented weavers demonstrating the process at a local workshop. The technique is complex and worth seeing. You then continue on your bus to the Sacred Valley and Urubamba. Depending on time, you can squeeze in a visit to an archaeological site. The staggeringly steep Inca ruins at the Ollantaytambo Fortress loom over the north side of the town of Ollantaytambo. They are famous for being one of the few places where the Incas defeated Spanish conquerors in a major battle. After walking around the site, you are drive on to your hotel where you have a welcome dinner at a fine restaurant in downtown. Today you have the day at your leisure. With so many restaurants and souvenir shops, Cusco has so much to offer you. You can also enjoy a stroll up to the old San Blas neighbourhood with narrow paved streets that remind us of the old set up of the city. In the evening, we suggest visiting Centro Cultural Qosco, shows every day at 6:30 PM, to see the local folk dances. You have an early morning departure from Cusco at 8:00 AM, and drive along the fertile Vilcanota Valley to the town of Checacupe (about 1 and a half hours). After a visit to the colonial temple in Checacupe, called “La Inmaculada”, you jump back into your minibus and start ascending the Pitumarca valley. You drive along the outstanding Japura gorge that leads you to Chillca. Upon arrival, you are greeted by the community before setting off on a short and easy walk to the first lodge (50 minutes). Once at the lodge (14330’) there is plenty of time to relax and enjoy the surroundings to the background of music provided by the Chilca, musicians. You have an early breakfast before starting your hike 8:30 AM in the wide valley of Upis. Here, the impressive Vilcanota mountain range emerges above the valley. The trail narrows as we make our way towards the waterfalls that flow from the Santa Catalina mountain. When you reach the small Paloma Lagoon, you see the countryside scattered with hundreds of South American camelids and alpacas (wild South American camelids are Vicuñas and Guanacos, domesticated ones are llamas and alpacas). After hiking past a second lagoon and crossing a series of moraines, you reach the your hotel, the Machuracay Lodge (15750’), located right at the bottom of the Apu Ausangate. After breakfast, you have your first big challenge of the day – a demanding crossing of Palomani pass, which sits at 16,750 ft. high. After taking in the great views, you head down to Ausangatecocha, another viewpoint facing the glaciated south face of the Apu Ausangate (20846ft). It doesn’t end there, and you continue towards the striking red sandstone formations of the Nevado del Inca. Our Tambo for the night is Anantapata Lodge (15520’), and you enjoy a hearty dinner before heading off to bed. Today’s trek is on a spectacular part of the trail. We hike between mountains of a myriad of colours; red, ochre, and blue strata all shining through. This is an area of geological wonder and outstanding natural beauty. The fauna doesn’t disappoint either. Be on the lookout for groups of florishing vicuñas as they are frequently spotted in this isolated area. You sleep tonight at the Huampococha Lodge (15800’) in the heart of large rock formations near a lagoon where huallatas, Andean geese, make their nests. Your last day you climb over the Anta Pass and gradually make your descent from the mountains. The landscape changes quickly as the red sandstone formations are replaced by limestone that forms a one-of-a-kind stone forest. This is a perfect habitat for vizcacha, members of the chinchilla family. By the time you get down to the valley, your bus is waiting for you to take you back to your Cusco hotel. Today you have a transfer to the airport for your flight home or your next destination! 8 breakfasts, 6 lunches & 5 dinners as detailed.